Can Laser Scar Removal Help Me? Scars can be one of the most psychologically damaging skin lesions. While some people view them as a “badge of honor”, many others see them as a painful reminder of a past trauma, illness or condition, such as cancer or acne. Maybe, your scar is from a C-section or an elective surgery. You may be really happy with the results otherwise, but just wish the scar wasn’t quite so visible. Even when clothing hides a scar, you still know it’s there. Treatment of scars can be pretty tricky. No two are ever exactly the same. Some are raised, while others are flat or even indented. The color of a scar can vary too from red to dark brown depending on lots of different things. 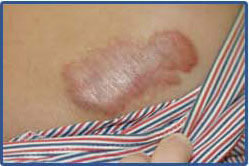 At Celibre Medical, we are experts at the treatment of unwanted scars. Not a lot of other Los Angeles and Orange County practices can say they specifically focus on this tough problem, but we do. We’ve helped thousands of patients feel better about their unwanted scars, and we are confident we can help you too! One of the most important aspects of treatment that we focus on when making your plan is what your expectations are. While we’d really love just to make your scar disappear altogether, realistically, that just isn’t possible. But, we have a wide range of technology and tools available at our disposal including surgery, lasers and injections that can help minimize the appearance of your scar no matter why or how you got it. Our goal is to help you feel the very best you can about your scar, even if we can’t take it away completely. What Are the Different Types of Scars and Why do They Happen? Keloid Scars: Keloids are a really difficult type of scar to treat because they tend to take on a life and mind of their own. They are more common in someone with darker skin, such as Asians and African-Americans, but Caucasians can get them too. They are raised, bumpy, dense growths of scar tissue that grow way beyond the original areas of injury or incision. To make things worse, they actually tend to get bigger over time! This makes them very different from other types of scars. They form because the body heals the area in a really disorganized way that makes too much collagen. And the process continues on well past the time of the original injury. Ears, chests and backs are common places to see keloids, but people can get them on the scalp and face too. They are difficult to treat even with surgery. 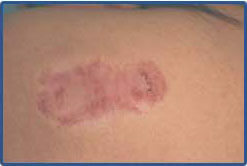 Many keloids will simply reoccur even when they are carefully re-excised. Surgical Scars: Even the most careful of hands can leave an unwanted scar after a surgery. The goal of a surgeon is to always try to minimize the scar left behind, but sometimes that doesn’t always go exactly as planned. While not as bad as keloids, these types of scars can be raised, but they stay within the original boundary of the initial incision. A lot of times, they will shrink or fade to become more skin colored over time, but that’s not always the case. Pigmented Scars: After an injury like a burn or surgery, or after an inflammation like acne, our skin often shows a red or darkly pigmented spot in the area after it heals. This is totally normal and happens in most people. Unfortunately, it can look worse if you have really fair skin or have a darker complexion. Excess numbers of tiny blood vessels or excess production of melanin (our skin pigment) can cause red or dark scars, respectively. These types of scars can be really difficult to cover up with makeup, especially if they are on the face. How Can Lasers Help Treat my Unwanted Scar? Laser technology has given us the ability to improve the color, texture and overall appearance of many different scars. In the right hands, lasers can make a big difference in the treatment of unwanted scars. Again, though, it’s important to reiterate here that all scars are different, and they all can be difficult and even tricky to treat effectively. The very last thing you want to do is to put yourself in the hands of someone who will make your scars look worse. Evaluation and treatment is a highly individualized process that needs to be done by an expertly trained practitioner who has treated a wide variety of scars. Evaluation of your scar should include a review of what features you really want to improve with treatment. Is it the color, the texture or both things that bother you about your scar? Often, we will need to touch, see and feel your scar to sort out what types of laser treatments might help you reach your goals. We have lasers that can help with both the color and texture of scars, but after speaking with you and doing a thorough evaluation, we may advise different options for you. Our goal is to create a unique plan of attack based on both the type of scar you have and your treatment goals that we believe will give you the highest satisfaction with your treatment. Celibre Medical has performed tens of thousands of laser procedures with over 20 state-of-the-art lasers. We’ve helped many people with all sorts of scars look and feel better, and we can do the same for you. Please give us a call today. During our free consultation at either of our Los Angeles or Orange County offices, we can walk you through step-by-step a plan that’s tailor-made for you. We understand it can be a difficult decision to move forward with treatment of your unwanted scarring, and we are here to help you do that. We want to help you look and feel your very best. Contact us today to schedule a FREE Laser Scar Removal consultation!